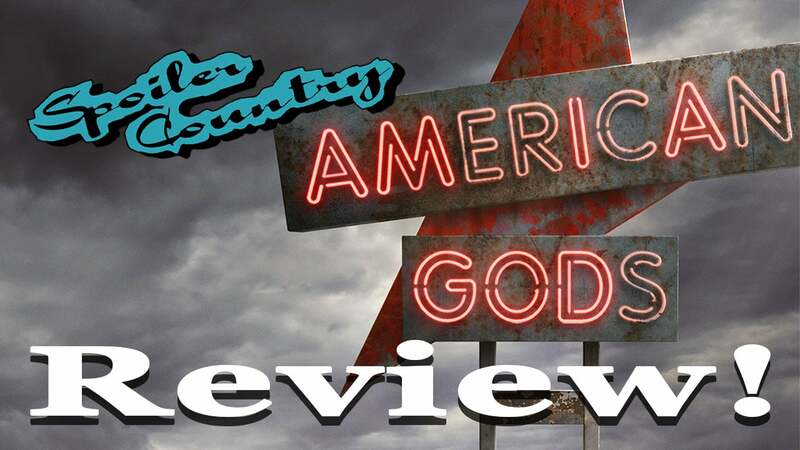 Where do you even start with a show like American Gods? American Gods is one of what I call my rotating three of books. That is to say it’s one of my top three favorite books I’ve ever read. To say I was excited when I heard Starz was making a mini series out of it would be a giant understatement. I’ve always thought it would make a terrible movie since there’s so much that happens in the book. There are so many layers to it a 2 or even 3 hour movie wouldn’t be able to touch it. But a mini-series? You could hit all the side stories and tales in that if you did it right. I’m going to try and not talk about the book much in this review, I will point out some of the major differences but I want this review to be about the show. This will be hard for me because I have read this book at least a dozen times since it came out and I’m currently listening to the all-cast version of the audio book, but I will do my best! The first episode was great, it was very much what I thought it would be, if only a little more bloody than I would have expected. Ricky Whittle looked almost exactly like I always imagined Shadow Moon to look and Ian McShane is a very well cast Wednesday (sans beard). The imagery of the show is in line with what you would expect to see in a show created from a story by Neil Gaiman. They do take some liberties with the story, but I’ll get there. The interactions between Shadow and Wednesday are great, you really get the feeling that Wednesday is a grifter and Shadow is just done with everything. Wait, hold on, I’m doing this like you know everything about the story. Let me pause for a moment and give you a quick rundown of the show, then I’ll head back into what I want to say. As always, below this line will be spoilers for the show. American Gods is the story of Shadow Moon and his part in a war between the old and the new gods. Shadow is in jail for 3 years, when he gets out he finds his wife, Laura (played by Emily Browning), has died in a car crash with his best friend Robbie (played by Dane Cook). He later finds out that Laura and Robbie were having an affair for the last 18 months. Shadow agrees to work for Wednesday and slowly starts to understand that things in this world are not what he thought, given he now works for a god and his wife has returned from the dead. His new employer is planning a war against the new gods. I think that pretty much sums up the overall plot of the first season. Mad Sweeny (played by Pablo Schrieber, is in the show a lot more than he is in the book, as is Laura. There is an entire episode dedicated to each of their back stories and what they where doing when the book was focused on Shadow and Wednesday. I liked it. While it was not in the book it was nice to get some explanations as to who Mad Sweeny is, how he got to America and his motivations. In the book we get told the story of Essie Tregowen and the piskies, but for the show they adapt it to Essie McGowan (why?) and it’s Mad Sweeny she leaves the bread out for. I was hoping for the piskies but I understand the change, it gives more meaning to Mad Sweeny’s character and it let’s them tell this great tale with a character that’s already established from the show. And everyone wants more Mad Sweeny! Let’s talk about Laura’s backstory. They really hinted that she was unhappy and depressed, as well as suicidal. I never got this from the book. I suppose it could have been there, since all we get of her in the book is after she is dead and wants to be alive again with Shadow. It ads a new element to her, but on her episode, which I enjoyed, they spend a lot of time pushing the narrative that she ‘loves’ Shadow but doesn’t really know what that means. That she is empty inside and she can’t figure out why. It’s only after she dies that she feels she has a purpose or a meaning. It works for the show I guess, but it’s not how I ever pictured Luara. The first season does jump around a bit from the book, but overall it works for the show. If you have read the book the season ends with them getting to the House on the Rock then fades to black. By the novel we are not even half way through the story when we get to the House on the Rock, so we will see how long they plan to make this show. I REALLY don’t want it to get drug out and not complete the story. I also REALLY don’t want them to leave out Sam Black Crow or when Shadow becomes Mike Ansel. All in all I’m glad they made the show and I’m not upset over the changes they did. It’s a beautiful story that I want to see them finish. So good job Starz, don’t screw up on Season 2! ← Keep it secret, Keep it safe!